This April 14, 2016, file photo, file photo shows former Alaska Gov. Sarah Palin speak during the "Climate Hustle" panel discussion in Washington, D.C.
Sarah Palin was interviewed for Sacha Baron Cohen's new show, "Who is America?" 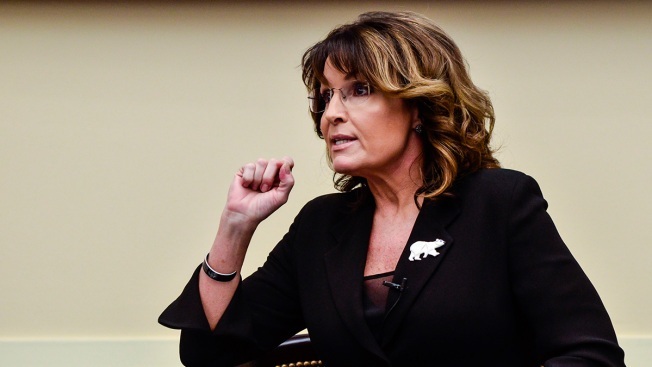 Palin says the interview was full of "Hollywoodism's disrespect and sarcasm"
Sarah Palin says she was "duped." The former Republican vice presidential candidate says she fell victim to British comedian Sacha Baron Cohen during an interview for his upcoming Showtime series, "Who Is America?" In a Facebook post on Tuesday, the former Alaska governor wrote she and a daughter traveled across the country for what she thought was a legitimate interview. But she says Cohen had "heavily disguised himself" as a disabled U.S. veteran in a wheelchair. Palin says she sat through what she called a long interview full of "Hollywoodism's disrespect and sarcasm" before she walked out. She is challenging Cohen and Showtime to donate proceeds from the show to a veterans' charity. Emails seeking comments from Cohen and Showtime have not been returned. The show premieres on Sunday.